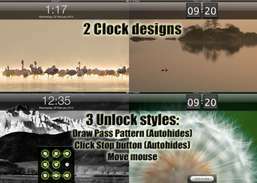 Screensaver + is an attractive yet practical screensaver app featuring:Sleek Design- Choice of two clock designs: Flip Clock and Traditional Clock- Displays current date and day of the week (Traditional Clock )- Phone like designChoice of 3 methods to stop/unlock the screensaver1. Draw your preset Pass Pattern (autohiding interface)2. Move the mouse3. Click the stop button at bottom of screen (autohiding interface)Screen saver- Displays dozens of beautiful system images- Allows you to select your own images- Start screensaver (slideshow) manually or set it to start automatically- Selected images are filtered by size to avoid displaying images that are too smallFully functional Status bar- Smart phone like design- Displays Battery level (shows charging when plugged in)- Displays current Wi-fi connection nameAnd many more options- Hide Dock or Status bar icon- Autostart at startup- Hot corner option to start screensaver- etc.